Wattson Blue aims to help you maximise your personal well-being and performance by helping you optimise your training. At Wattson Blue, we believe in the concept of KISS (keep it simple, stupid) – a recovery and training plan should not be that complicated. Keep it simple, do the basics, and you should see benefits long term. However, we believe the best way for each individual to achieve this is to have some understanding of the data and metrics being shown in Wattson Blue. Don’t worry, the concepts may seem complicated, but trust us, they are rather simple once you learn a few ideas. In order to understand how much stress your body goes through during training, similar to other sports performance apps and services out there, Wattson Blue gives a training load score to each training session and uses these to calculate some important metrics to help you monitor your well-being and performance, particularly form, fatigue and fitness. This article provides a concise summary of what these values mean and how to interpret them. We also recommend having a look at many other interesting and informative articles elsewhere on the internet written about how these values are often calculated, and what they mean. As always, the more you know, the better you can make decisions about your training and recovery. For each training session, Wattson Blue calculates a value for the training load (or Training Stress Score/TSS – copyright of Training Peaks), using power, heart rate, pace, or rate of perceived exertion/RPE (i.e. how challenging you found that session). 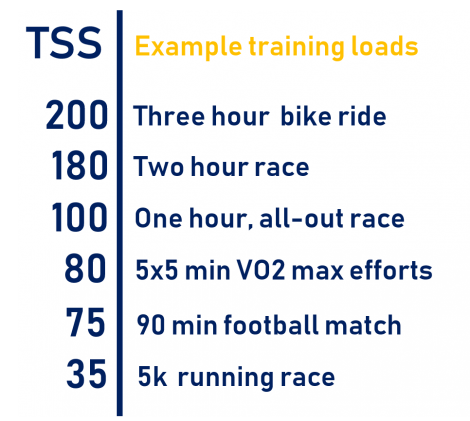 Some examples of possible training load values are outlined in the table. A load of 100 would equate to an all-out maximal one-hour effort. As such, a load of 200 should not be possible for a two-hour race since you could not continue at the same rate for another hour (If you do end up with such a training load, your functional threshold values are most likely wrong, and should be re-adjusted). Fatigue (Acute Training Load/ATL): a rolling 1-week average of your activities’ training loads. The general idea is that you accumulate fitness by exercising, but your more recent exercise causes you fatigue. What is Form and how do I interpret it? Form (Training Stress Balance/TSB) is calculated as Fitness – Fatigue. In very simple terms, if you have negative Form you are generally getting fitter because your fatigue (recent load) is higher than your fitness (longer term load). You are training your body to take on more load. So, negative Form implies that your long-term fitness is improving. On the other hand, positive Form means you have been training less than usual recently. It generally means you should be feeling fresh. You might often look for positive Form or small negative form just before an event, or every few weeks when you are periodising your training. So, you might look for Form above -10 when tapering for a race or during recovery weeks, every 3-5 weeks. If you ramp up your training load very quickly (e.g. going from a couple of hours of exercise a week to a lot more), you might end up with a very negative Form. Most athletes might struggle with Form below -40 or -50 for too many weeks. Generally, unless you know what you are doing, avoid going below -20 for too many consecutive weeks. At the periods of very negative form, it’s important to stay on top of your recovery, sleep and nutrition. Wattson Blue is ideal for that, as it tracks your key metrics. Some athletes can feel ready for competition with a small negative Form while some many need a few positive days and longer recovery periods. It depends a lot on you and your recovery from training. Future blog posts will further explore this. The graphic outlines a summary of how you may interpret different Form values. How quickly can I increase my fitness? This is a very individual thing, but generally a lot of athletes might struggle to increase their fitness by more than 5 points per week, week in week out. Use Wattson Blue to monitor your recovery metrics and if you feel you are struggling to recover, reduce your training load to make sure you are benefiting from all the training rather than just accumulating fatigue, and risking burning out. Remember, as you exercise more, you accumulate more fitness. The fitter you get (the higher your Fitness score), the more you need to exercise to keep that level. It can be a vicious circle. Always remember the other important things in your life! A word of warning. Despite the fact that it is called ‘Fitness’, you generally don’t want your highest Fitness on your race day, but maybe 2-3 weeks before the actual competition. Generally your ‘Fitness’ peak will come with some fatigue too – so for your main races/targets you are actually looking for a slight drop in Fitness to make sure you are fresh on race day. Is that all I need to know to get fit? Sadly no. This is only a summary of what these numbers mean and the key ideas. This article should have outlined how to interpret the numbers which Wattson Blue generates for you. Setting up a training plan requires many more considerations including periodisation, intensity and training in the right zones, etc. There is so much information online about these concepts. As always, we recommend reading more about the concepts we are introducing here. The more you know, the better decisions you can generally make! 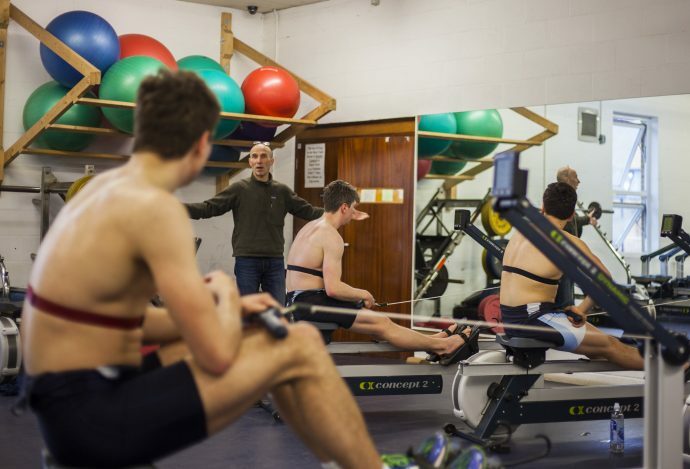 Original credit for training load, TSS, or Training Stress Score (Trademark of Training Peaks) goes to Andrew Coggan, who built it off some of the heart rate based models by Banister in 80’s and 90’s. You can read more about all of this on Training Peaks website here.